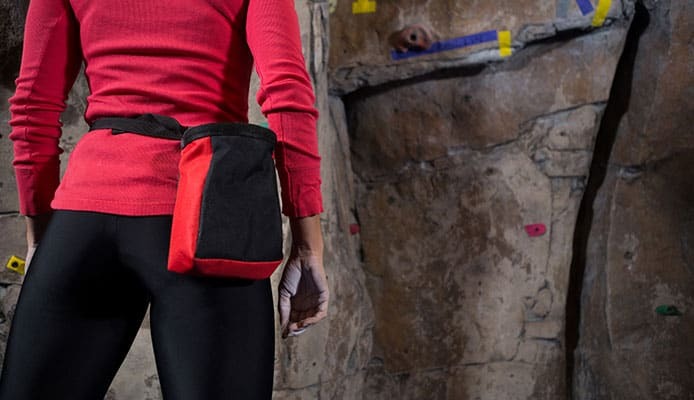 Sometimes your pockets aren’t going to be enough to hold all your items and you might not want to carry a bag or even a backpack, this is where the best fanny pack would be perfect as it is able to give you a comfortable space to store your items. There is also the security issue too, as people feel more comfortable when they have their important possessions right there in front of them with the best waist pack possible. In order to choose the best one though, it’s important to balance up all the key features. 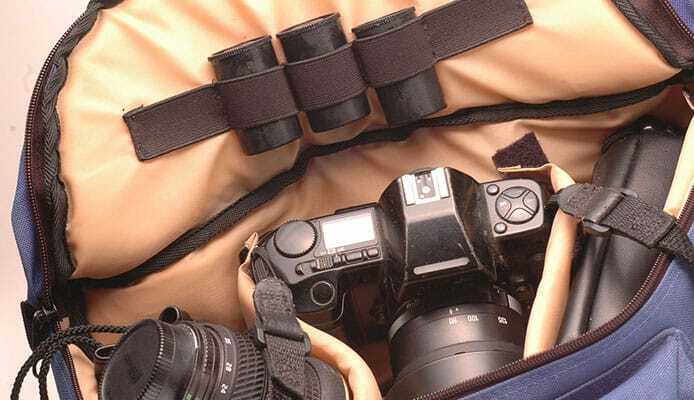 From storage capacity and pockets, to weight and waterproofing, we will look at all those key features and have also completed fanny pack reviews on the best products on the market. Once you’ve finished reading, you’ll know exactly how to choose the best fanny pack. This is a top rated fanny waist pack from Freetoo which gives you all the key features that you will be looking for. It is able to give you a lot of room without being too big and has five separate zippered compartments to store all of your essentials. The bag is made of highly durable polyester which is also going to give you water resistance too, that build quality is added by the heavy-duty zippers it has. It is highly adjustable and will be able to sit very comfortable on your waist. Overall, this is the perfect casual fanny pack. 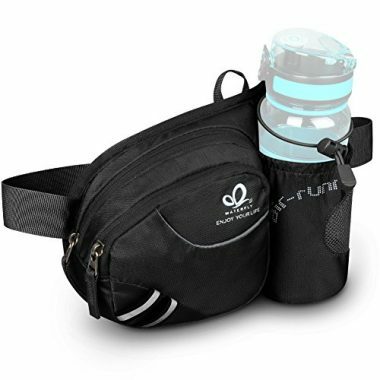 This is a smaller product which will work perfectly as a sport fanny pack but is very versatile and would be great for many different situations. It is made from nylon and comes in a wide range of great colors which will be able to give you your own style. It is water resistant and will do a good job of protecting your items from the rain. It’s very light and also highly adjustable, meaning that it can easily fit men, women and children. It features one main compartment, two front pockets and a hidden rear zipper. Tinyat have been able to produce this brilliant outdoor fanny pack which is made of durable nylon which will last you for a long time. Numerous color options are available and the bag features a large front pocket for your valuables and a hidden back pocket. 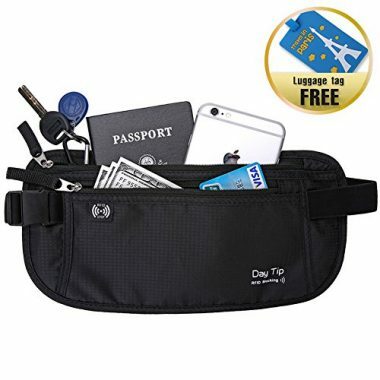 This will be light and comfortable around your waist making it the ideal fanny pack for travel. 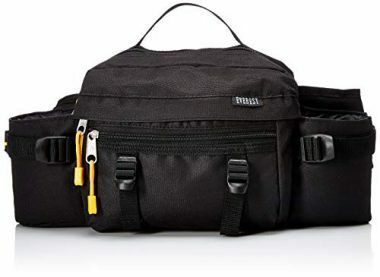 The waist bag also looks great too and is highly adjustable, meaning that you would be able to walk around all day knowing your valuables are secure. 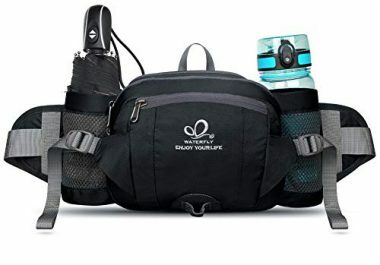 If you were looking for a hiking fanny pack then this product would be very useful, especially with its integrated bottle holder which is highly convenient. Another aspect of what makes it a great backpacking fanny pack is the water resistance that it has. This will be able to hold off the rain and keep your items dry. This makes a great camping fanny pack too with its reflective strips allowing you to easily be found at all times. It has two sizeable pockets to keep all of your items safe. This is a much more slender hip pack which is aimed at those who have security on top of their agenda. 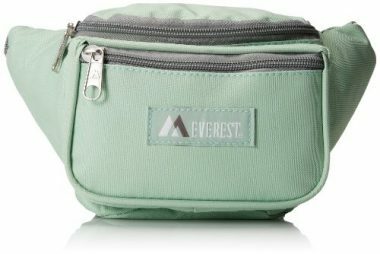 This lightweight fanny pack is ideal for being able to store your valuable items close to you in a zipped up pocket but doesn’t have room for much else. The material is waterproof and one great feature is that it has RFID material to block any attempts are reading your cards. It’s slender and discreet to give you peace of mind and it is highly adjustable with a mesh back to give you comfort. In a complete contrast to the previous product this is a hiking belt pouch which is going to be able to give you nearly as much space as a traditional backpack. 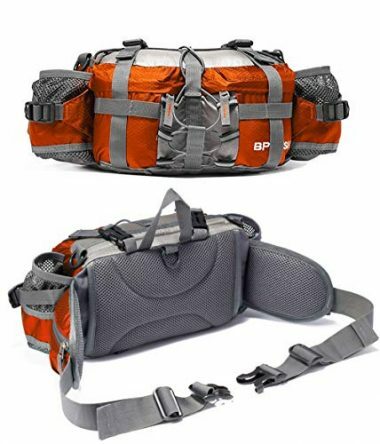 That makes it one of the best waist packs for walking but also for other activities such as camping or fishing. It can be worn in three separate ways as it can be used as a traditional fanny pack if it’s not too heavy, over the front with a strap if it gets heavier and around the back if it is quite heavy. There are two bottle holders and the fanny pack features a lot of storage space. This is another product which has a lot of storage space but it is very comfortable and well-fitting which, means it can work brilliantly as a running waist belt or for any other high intensity activities such as hiking or various sports. It has two bottle holders and comes in a range of different colors. It is made from high quality nylon but has breathable pads which add to your ventilation. It’s a very comfortable product with lots of padding and straps to ensure a secure fit. This tactical waist pack is going to be useful for a very wide range of different situations such as hiking, hunting and fishing but can even be used for something as simple as shopping. It’s highly durable but it is also lightweight too and easy to carry. There are numerous different pocket options including three different pockets at the front as well as a main compartment, which can fit plenty of different items. It also comes in a great range of color options and you are sure to find something unique to you. This is one of the most stylish waist packs which are on the market as it looks great but is also available in a wide range of different colors and designs depending on your style. It features three large zippered pockets with one on the front, the top and the back. 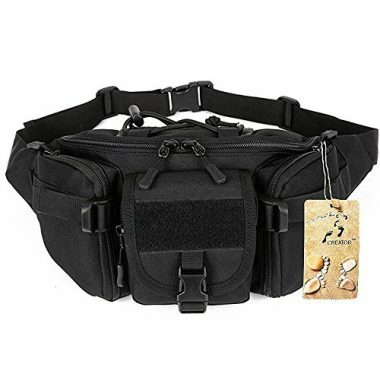 It has a highly adjustable snap waist buckle which will be very easy to place on and overall this is a more stylish and simple fanny pack which is ideal for those looking for a nice looking solution. It’s very highly rated which gives you confidence that you are getting a great product. This is another very highly rated from Everest but one which comes with a very different look. This has activities in mind as it’s going to be able to give you a lot of support and also features two bottle holders to make sure you stay hydrated. Between them it has three large compartments which are going to be perfect for storing your items and it is made from a waterproof polyester material which is going to protect everything inside. These qualities make it an ideal fanny pack for hiking, hunting and fishing. 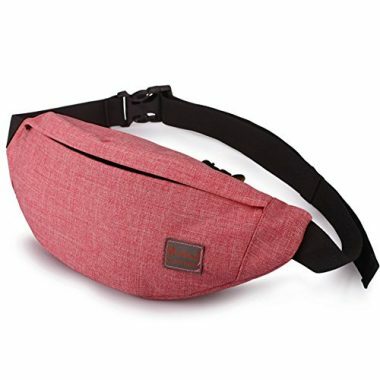 When choosing a fanny pack, storage space is going to be very import depending on your needs and this type of product comes in a number of different sizes as they are made for different activities. Some people just want to secure their valuable items such as their phone, keys and money and therefore don’t need much space at all. 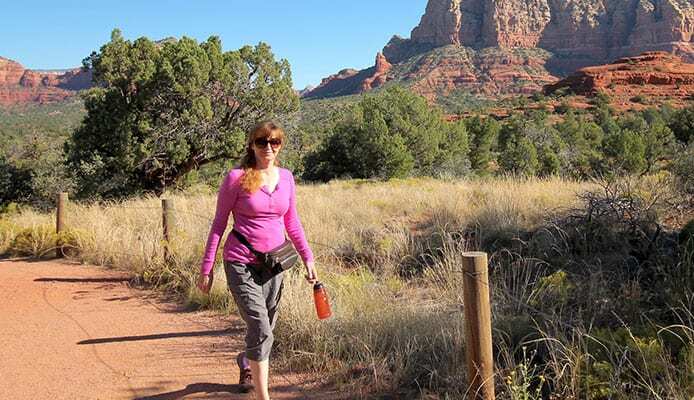 Others will see a fanny pack as a good substitute for a backpack on a hiking trip and therefore will need to take more gear with them, including water bottles. Other activities such as fishing take up a lot more space and therefore you need to work out what your specific needs are. Getting a large fanny pack when you want to go running, for example, wouldn’t work. The pocket options on a fanny pack come in many different varieties and this, again, is often down to a personal choice and what your needs are. Most of these packs will have one large main compartment though where you are able to store most of your items. The front of the pack will be configured in different ways by different brands. Some have one large pocket on the front while others have several pockets. Having a large number of pockets would be great for an activity such as fishing but might be a little too much for traveling. If you have a pack which was mostly designed for the likes of camping, hiking or backpacking then it’s a great idea to have one with water bottles so that you don’t have to carry them. Another great feature some packs have is a hidden pack pocket to store your valuables. Weight is going to be an important feature in the fanny packs as the whole point of them is to be light and portable, and therefore it makes it a great substitute to the backpack and avoids the use of having an over the shoulder bag. As we have mentioned previously, these key features will vary in importance depending on the purpose that you are going to have. If you are going on a hiking trip, for example, then it’s likely that you are going to have to have a heavier bag to support those extra items. If you are going to be doing other activities though, then you probably would want to make sure they are light as possible. Most of these packs don’t weight a lot though. For those that are capable of holding extra storage, it’s important to look for additional straps to be able to hold that weight. One of the main reasons that you might get a fanny pack is for the security that they provide. There is something reassuring about having your valuable items right in front of you. This is especially important if you are traveling or in a crowded place. A lot of major cities are notorious for pickpocketing and fanny pack can be a brilliant way to protect you from that. One great feature that a lot of these products have is a back pocket which will be hidden from view, which is a great place to store your possessions. Some of these bags are a lot smaller and specifically have security in mind with little space for non-valuable items. One useful feature that can be found in the bag to block RFID signals which can be used to steal card information. Regardless of what type of activity you are doing, it’s likely that sooner or later your fanny pack is going to come into contact with the water. This could be from splashes or spills but will most likely be from contact with the rain. Due to this it’s important that your fanny pack has a good level of water resistance in order to keep your contents dry. The materials that these products are made from are usually tough and durable, with a water-resistant coating added to them. Other materials are able to promise waterproof protection which is able to give you that added level of security which can be useful but the water would still be able to seep in through the zips if it was seriously tested. As these packs generally have one strap around the waist, you want to make sure that they are going to be as comfortable as possible. That means making sure that they are the correct length and sit correctly on your waist. A lot of these belts have a high degree of adjustability and are able to fit on men, women and children. Other belts are more specific and therefore it’s important to check that the belt is going to fit you before you make your choice. For the bags which are able to take a lot more weight, additional straps might be added to them in order to make them more comfortable. These might allow you to wear the bag over the shoulder or wear them like a regular backpack and it can be good to have that versatility. Water is very heavy and therefore these types of holder are usually designed for an activity where water should specifically be needed such as with running or hiking. These usually come in the form of mesh holders which will be either at the side or front of it. These can be very useful if you were going to be taking a bottle on your trip anyway as it gives you somewhere to place it. There are packs out there which have one slot or two, depending on your preference and how much water you plan on taking. A: A fanny pack is a fabric pouch which is going to be secured with a zipper. This pouch is generally worn around the hips or the waist which will give the user easy access to the items that are inside, making it a highly convenient product. These packs are often seen as a means to carry extra items which you either can’t or don’t want to carry in your pockets. They prevent you from having to take a bag or a backpack and allow you to take something a lot more light and compact. Q: Can The Fanny Pack Be Concealed? A: For many people they see the fanny pack as a security item and therefore would want to be able to hide your valuables from anyone who could possibly steal them. Most fanny packs would be able to be worn under your clothes so could be hidden. Whether this would be comfortable or not would be another matter. These packs can generally be held quite close to your body and strapped on tight with the harness. Many of them also have a secret pocket at the back to give extra security. Q: What Are The Benefits Of Wearing A Fanny Pack? A: As we mentioned there, one of the reasons that people like to wear fanny packs is due to the peace of mind that they get knowing that their valuables are close by. Having them in your pockets or your bag can make them much more liable to theft. They are also highly convenient and allow your arms to be free while not having to worry about carrying any other form of bag. They are a great feature for the likes of hiking and traveling where you want essential items close by without needing a backpack. Q: Are Fanny Packs Outdated? A: There was a time where fanny packs were seen as a very common item and one which you would see all the time when out there in the center of a city. It’s no secret though that their popularity plummeted and became a fashion faux-pas. 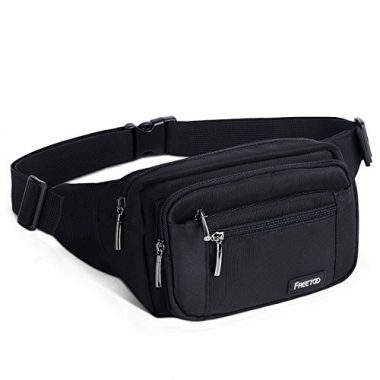 There seems to have been a change in the last few years of practical items regaining in popularity and this is definitely the case with the fanny pack. They were outdated once but have very much come back in style. Fanny packs are an item that will be able to make any activity that you are doing a lot easier. You might be heading out for a walk when you are on a camping trip, traveling around the work or planning a short hike in the day. Whatever you are going to be buying your fanny pack for, they are going to be able to give you a high level of convenience. They can be made differently for different purposes though and therefore it’s important to make sure that you are getting a product which is able to match what you want to do. In order to do that, you want to look at how much storage space that it has, the type of pockets that is features, the weight of the bag, how waterproof it is and whether or not it has other features such as having holders for water bottles. Security is also a big issue for many and having a bag which is going to sit close to your body, has hidden pockets and features such as RFID blocking are going to be important. Being able to keep a close eye on your possessions can be very reassuring, especially when you are traveling. You should now have all the knowledge that you need in order to choose the perfect fanny pack for you. They have roared back into fashion which is great news, as they are an item which is going to make your life easier and keep your essentials and your valuables in easy reach.